Origin and Habitat: Garden origin. The natural species is endemic to Mexico where it is known to occur in the states of Aguascalientes, Guerrero, Guanajuato, Hidalgo, Jalisco, México, Michoacán, Morelos, Oaxaca, Puebla, Querétaro, Veracruz and Zacatecas. Description: The typical Coryphantha elephantidens is a a large, depressed-globular cactus up 18 cm in diameter, very large tubercles 20-30 (60) mm wide, rounded on top, pentaedrical at the base, always broader than rounded, without glands, the tubercles axil is woolly. The tubercles are capped with a 5-8 of stout recurved radial spines, 18-26 mm long never erect, but adpressed to the body. The sweet smelling flowers are large 6 to 7.5 cm whitish to pink-coloured. Variegated form: Variegated Coryphantha elephantidens are cultivated for their beautiful stem that have sectors, patches or stripes with two colours, yellow and green. There are several forms of variegation. The extent and nature of the variegation can vary, and sometimes the plant will return to the green form. In others it is stable and does not change under normal conditions. Flowers are produced only on the crown of mature specimens. Variegated specimens are sometime grafted on stronger species, called the stock, that can be any number of different columnar cactus. Cultivation and Propagation: Variegated cacti are regarded as choice and difficult in cultivation, but despite that many of them are relatively easy to grow. But be aware that they cannot tolerate prolonged exposure to direct sun light (especially during the hottest summer days), so grow them in half-shade or under filtered sun. They are sometime seen as grafted plants, but some of this colourful plants (those with some chlorophyll) are able to grow on their own roots and are priced by collectors. Soil: Use mineral well-permeable substratum with little organic matter (peat, humus). Watering: Water sparingly from March till October, and keep perfectly dry in winter, at temperatures from 5 to 15 degrees centigrade. (In general these plants are more tender and cannot endure freezing temperatures). In the rest period no high atmospheric humidity!! Propagation: By seeds, grafting or cutting. Because the variegation is due to the presence of two kinds of plant tissue, propagating the plant must be by a vegetative method of propagation that preserves both types of tissue in relation to each other. 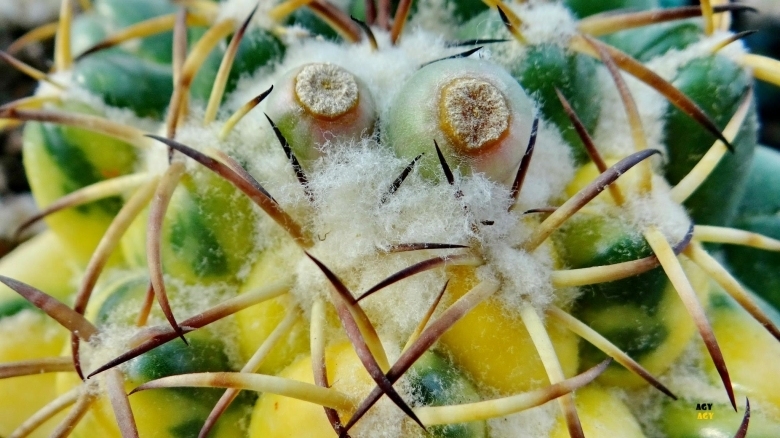 A most common way way to cultivate this partially de-coloured cultivars is to graft them onto another cactus which has chlorophyll and which will provide sugar to the mutant scion. The chlorophyll containing bottom part of the graft, called the stock, can be any number of different columnar cactus species. Remarks: Seeds from variegated parents often give raise to some variegated seedlings too.